Ladybirds, Bees, Moths, Butterflies, Dragonflies, Damselflies, Woodlice. These are fairly common insects - otherwise known as bugs or beetles - but what is it like to discover a totally new minibeast, for the first time... Look carefully in the grass and on the underside of leaves and a whole new world of discovery might on the doorstep! Insects make up a huge percentage of all species and can be classified and considered in many ways. The Wildlife Trusts' nature challenge invites nature lovers to look more closely in the garden or local green space - they suggest to 'sweep like an entomologist' and have put together instructions to make your own. It can be quite surprising to see the assortment of creatures, often with striking features and bright colours, that lurk beneath the long grasses of meadows and semi-wild nature gardens but that's only the start of this fascinating subject. Finding just one mini-wildlife creature and researching it can be a project all by itself - discover its individual characteristics, its habitat, its risks to the environment or, even, its benefits to other species! An entomologist studies insects! This link from The Royal Entomological Society explains it further in their fun short video! Today's image was going to be about ladybirds! A sycamore leaf was entirely covered with aphids on its underside. On another leaf there were more aphids and on another - a ladybird larva. 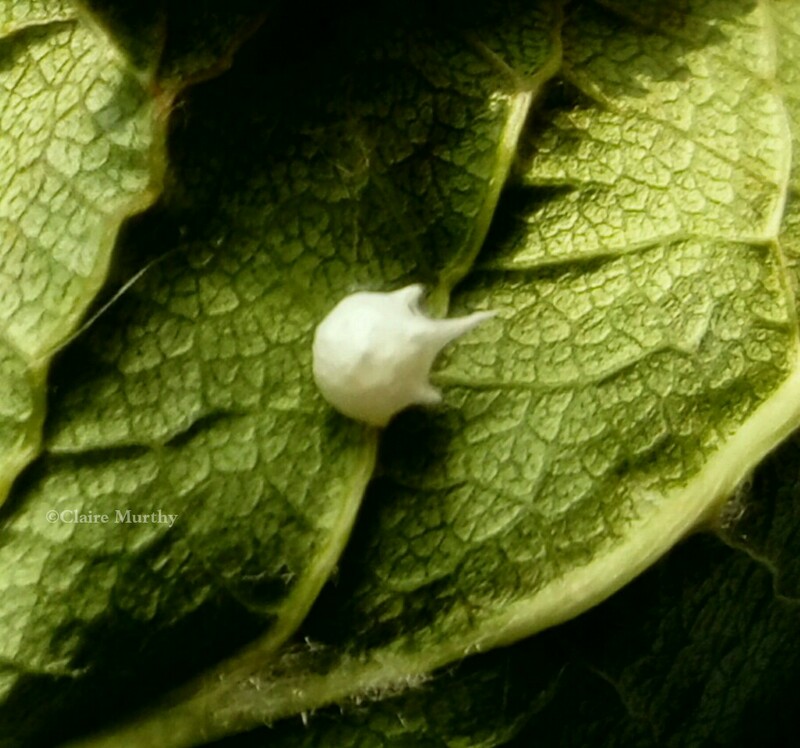 It raced around the leaf, along its edges, up its stem and gobbled an aphid fit for a banquet! 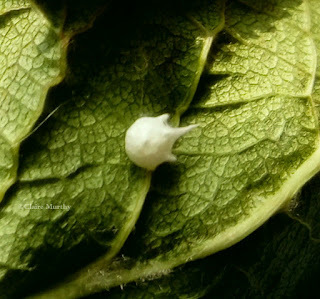 Wildlife Art and Nature Blog : a garden spider sac full of eggs! There was something new to discover - a strange and tiny sac less than 2mm in diameter - almost impossible to photograph! This image does not show the crisp edges and points of this sac, which was beautifully sculpted like a miniature architectural piece of art. Inside will be hundreds of tiny spider eggs. A little investigation led to... a spider sac of a paidiscura pallens; the sac is larger than the spider, so those baby spiders are going to be miniscule! For the #30dayswild post in 2016, Nature Challenge : Creepy Crawly, click here.